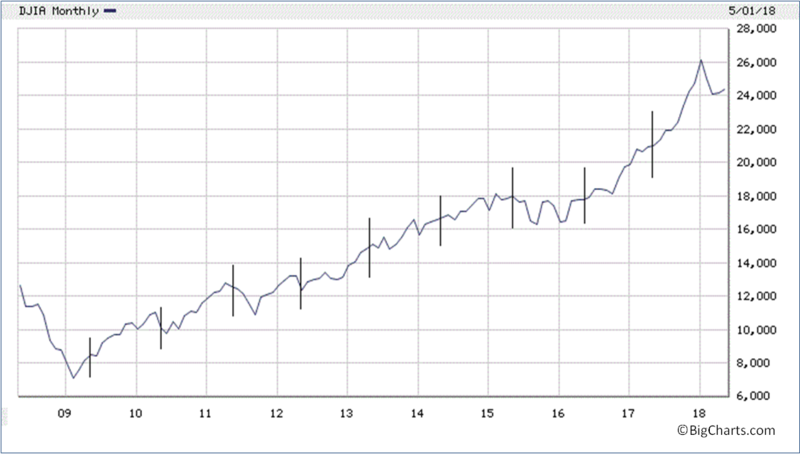 With this month marking 10 years since the stock market dramatically rose from the ashes to begin a climb that has taken the market, using the Dow Jones Industrial Average, from an intraday low of 6,470 to about 26,000, there have been endless references and articles published about this long running bull market. One of the very best I found was a piece written by James Mackintosh of the Wall Street Journal who makes the point that during this long run there were actually a number of major events that caused the market to have heart pounding drops. And I think, most importantly, he cites how while it seems easy to think you would be fully invested during this 10 year run, in reality, it would have been very difficult to have stayed in the market through all those events. Each time the market started to drop 5, 10, 15% or more, it would have revived fears of what happened in 2008 and 2009 when the markets lost about half of their value. There was a fear that the market was going to plunge again and wipe out any amount of gains that were recaptured from that March 9, 2009 low. But looking back, history keeps teaching us after all these events, the market has always recovered and gone on to reach new highs. Serious investors understand and appreciate it is market volatility that gives us the opportunity to earn more than a very low, safe rate of return. But to have volatility, there needs to be many of these same people fearing the decline is going to be so bad they want to sell and get out. So how do you learn from history and take advantage of future growth. This is where our proprietary process called the Four Component Portfolio Plan™ comes to the rescue. Certainly not all our clients have to make use of this process in a formal way, but many find it extremely helpful. At the heart of the process, we determine with our clients the amount of assets we can have exposed to the ups and downs of the market - where we expect to make our real gains - and what amount, or percent, of assets must be in an asset protection position where the return will be less, but the risk virtually non-existent. There is more to the Four Component Portfolio Plan™, but fundamentally, this process gives our clients the ability over the long run to capture the gains necessary to achieve their goals, riding through those storms that come up so quickly, because they know looking ahead are better times. Over the next few weeks you are going to see (at least, they hope you see) ads from a national campaign by the Certified Financial Planner Board of Standards for the CFP® certification. And, because I am often told I shouldn’t take for granted everyone knows what the three letters after my name represent, it seems like a good time to highlight them. The campaign stresses the value of having a financial plan and working with a CERTIFIED FINANCIAL PLANNER™ professional. It is part of the CFP Board’s effort to get people to understand and appreciate the value there is in working with someone who has taken and passed all six parts of the course. The extensive study covers important factors such as taxes, insurance, estate planning and retirement planning. While it obviously does not make someone an accountant or attorney, it allows us to coordinate if, and when, these other professionals might be called in to act on some of the recommendations of the financial plan. I actually studied for the designation early in my career. I recognized to be successful I would need to provide more value to people than others. Over the years we at Royal Capital Management LLC find we can be of more service if we take a Total Financial Care™ approach – which we do and in fact have trademarked the phrase. It is part of who we are, so whenever you are considering some financial matter, such as whether a trust could benefit you, planning on how you will draw down your assets in retirement or considering an insurance need, we are here to help. There is no additional cost for our planning services as we see it as doing what is necessary to make sure we are serving you to the utmost. I want to point out being a CERTIFIED FINANCIAL PLANNER™ professional does not make a person a fiduciary. Any stock broker or insurance agent can strive to acquire the degree but unless they state they are working with you as a fiduciary on all matters, they can still legally put their interest ahead of yours when making decisions. We are proud to say we are always working with you as a fiduciary. Right about now the news media should be announcing we have been enjoying the longest running bull market in recent history. Actually, it turns out measuring the time the market moves up or down is subject to interpretation. The record depends on how you calculate some of the time periods and whether you round off figures. But no matter whether this truly is the longest bull market or not, it has been a great ride starting in March 2009, coming up from the depths of the financial crisis. Since then, through the close on August 17, 2018 the Dow Jones Industrials Index is up 292% and the broader Standard & Poor’s 500 Index is up 321%. When looking back the climb naturally always seems easier than what it was. In reality there were many major concerns along the way. Recall the E. coli scare and North Korea’s threats to launch missiles our way. The unravelling of the European Union, and for the past few years the ad nauseam comments from many analysts that the market has gotten, as they say, long in the tooth. For us, however, years of experience continues to reinforce our management style of consuming as much information as possible but maintaining a focus on the primary fundamentals that drive the market - corporate earnings and interest rates. On that note, corporate earnings just had another outstanding quarter. Looking ahead, the very latest figures show consumers are continuing to spend money on retail, travel, home repairs, etc. This means revenues and profits should be fine, at least for the near term. Regarding interest rates, so far, the Federal Reserve has been taking a very measured approach to moving rates higher and the market recognizes this as a positive, as it will hopefully prevent inflation from suddenly appearing. It is true common stocks are rather highly priced and are obviously always vulnerable to negative news. In closing, keep in mind it is the market’s uncertainty and volatility that gives us the opportunity to make money. As we enter May the stock market seems to have gotten stuck in a trading range bouncing several hundreds of points up and down as investor focus goes from optimism over strong corporate earnings, low unemployment and positive tax reform; to pessimism believing stock valuations have gone too high and higher interest rates will torpedo prices. I’m reminded of an old Wall Street saying “sell in May and go away”. The implication being that nothing much good happens during the summer so traders should take profits and go off to the Hamptons for summer. Like all the other cute Wall Street adages, there is some truth but not enough to make it a strategy. Look at the chart below. You can see how in the past decade selling in May could have cost you opportunity for more gains, let alone factoring in paying taxes on short term profits if you sell before they become long term profits. There is no crystal ball in this business, moves and positioning are done based on economic data and years of experience in projecting out from the present. As of this writing the Dow Jones Industrial Average is still down about -8% from the market high reached in January, but we believe it is reasonable to expect the stock market to end the year much higher. Consider the main driving forces. Strong corporate earnings get a check mark, so does spending by consumers, as does low energy prices, very low unemployment, and modest interest rates. Therefore, we remain pretty much fully invested with just a small percentage in cash because there are a number of concerns that could give us a further drop and we would like to have some cash available. Regarding the issue of rising interest rates, for stock investors we really do not see this stopping the market’s climb at least until rates move significantly higher. However, for bond investors the impact is a much more immediate matter. Look what happened earlier this year. (Courtesy of Advisors Asset Management, parentheses ours). “The start of 2018 seems to have caught many investors off guard with a 60 basis points move higher (just over ½%) already this year. To put the magnitude of the move this year into context (at that time), the 2.25% Treasury due in 11/15/2027 is down -5.15%.…. That’s over two years of income lost in 4.5 months and you own a bond that doesn’t mature for another 9.5 years“. Bond buyers need to keep in mind during the past few decades, rates have drifted downward and that meant you could buy a good quality bond, receive a nice stream of predictable income and almost never see a loss in your purchase. If you monitor the municipal bond yield curve you would see it is a little steeper than the Treasury curve. So, we continue to find better value at the short to tight intermediate range of maturities. You give up a little in interest rate income but your principal will come back to you sooner, so if interest rates do move up as we expect, that money can be reinvested in even higher yielding bonds. With everything going on both economically and politically, we can expect a busy summer. But remember, volatility provides opportunity. With reduced costs and efficiencies, trusts are no longer just for the very wealthy. Recently we have been working with a couple of families exploring using a trust and I thought I might share two quick examples with you. A lot of people have heard how a living trust can help eliminate, or at least reduce the time and costs of probating an estate at death. And that is very true, but you may also want to consider a trust for protection reasons. Let’s say you have lost your spouse and while there are children or others that might be involved in taking care of you as you age, you feel somewhat vulnerable. It can be a great peace of mind knowing if you should start to falter, you have in place a document that spells out exactly how you are to be taken care of for the rest of your life. For instance, you do not want to be moved to a nursing home but instead want to remain in your own home and have additional aids and services brought in to you. 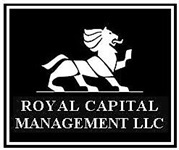 Another safety factor is you can name Royal Capital Management LLC in your trust as your investment manager. This way we can continue to watch over your portfolio as we have for so many years. A trust can also be used to protect the assets you have worked so hard to accumulate from disappearing through things like divorce, lawsuits and unnecessary taxes as they are passed on to children and perhaps grandchildren. You might leave money and how it can be accessed to one child differently than how you leave it to another child. While not attorneys, and this is certainly not meant to be tax or legal advice, being a Certified Financial Planner™ and co-founder of the Boca Raton Estate Planning Council and its second President, I have ample experience in how and when to use them. Our role is to help you decide whether a trust would be helpful to you, and if so, work with your, or another attorney, to have it accomplish exactly what you want it to do, while you are alive and after death. Because of our independent structure and fiduciary relationship with you, you have the assurance of knowing we can help you select a corporate trustee if you want one. We have access not only to Fidelity’s Trust Company but other banks and trust companies as well, so we can assist you in selecting the best, most economical, trust service option for you. So just know, if you ever want to talk about whether a trust might be something you should consider, we can help you through the process. Almost exactly nine years ago, March 9, 2009, the stock market ended the day down yet once more and it seemed there was no bottom in sight. At that date the Standard and Poor’s 500 had fallen about 57% from an all-time high reached just about a year and a half earlier.1 But instead of going higher as most forecasted, the markets were in their steepest decline since the Great Depression in the 1930s. The headlines and predictions were mostly about how much further the market could fall. However, the next morning instead of continuing the decline, to what was already a 17 month long bear market, stocks started to rise. And rise. And rise. Climbing to where we are now, even after a number of corrections along the way, up about 400%.1 Two dramatic lessons on the dangers of extrapolating the stock market’s current performance at any given time. As this year started most investors and analysts were calling for a continuation of the market’s climb. And, just for the record, so were we. But are we all in danger of simply extrapolating last year’s fabulous results into the future? For our part, while we expect the stock market to move higher, we are not expecting as robust of a year. Fundamentally, this soaring stock market has had the benefit of both of its two big engines - corporate earnings and low interest rates - working for it. Going forward we think the interest rate engine is going to lose some of its driving power. We will still climb, but more than likely at a more measured pace and with a lot more effort. It is a pretty safe bet (not certain, but pretty certain) to forecast interest rates will be rising. In fact, we should see an increase later this month when the Fed meets. The uncertainty comes in trying to figure out how much and how fast future increases will be. Part of the problem we face is we are in unchartered waters. In recent time the Federal Reserve has never been raising rates from such a low starting point, and at the same time reining in the massive bond buying program they initiated to help stabilize the country’s, and perhaps the world’s, financial structure. Both Fed actions will push rates higher, but how quickly and how high is the question. Add in possible unintended consequences from the passage of a very aggressive tax reform act, and now tariffs that no one seems to be able to agree on, and you can understand why we believe the environment for stocks and bonds is not liable to be simply a continuation of last year. Do You Believe In The Santa Claus Rally? You may no longer believe in Santa Claus but there is a very good reason to believe in the Santa Claus rally. What exactly is the Santa Claus rally? Well, Wall Street, being a very competitive and stressful business, seems to try to add a little levity by coming up with some cute little phrases like “sell in May and go away”, etc. Most of these catch phrases actually have some basis to them, although I wouldn’t do my investing based on them. However, the Santa Claus rally, which refers to the stock market making a good little run near the end of December, does have a real basis for it. Well, putting general economics aside, there are several factors that converge toward the end of the year that contribute to this phenomenon. If it has been a successful year, such as this one, many fund managers and traders - notice, I said traders and not long term investors - look to sell in late November and early December to lock up profits to get bonuses, etc. Also in early December many mutual funds make sizable distributions of capital gains and interest and that reduces the fund’s net asset value by the same amount. For example, shares that are selling at say $14, after a distribution of $2, would be selling for $12. So if you don’t plan to hold the fund much longer anyway, it could make more sense to sell it before the taxable distribution is made. These two factors alone add more selling pressure than normal to the market. Now couple this with the fact that historically the market is often very good at the start of the year as new money comes in from retirement and pension plans. There are no guarantees of course. Just last year the market broke from this pattern falling instead about 10% in the first six weeks of the year before rebounding and eventually finishing the year up in double digits. Nevertheless, you can see if investors believe January will get off to its usual strong start, then they would want to get all that money raised from all the selling, right back into the market, driving up prices. Thus the spurt that leads to the phrase the Santa Claus rally.